Man, was I angry! The economy was getting me down, I felt victimized by a series of unfortunate events, and even though I always strive to be loving to other people I was losing my composure on a regular basis. That just won't do for the maker of a product called "Mama Love"! So "Soothing the Angry Heart" just had to be born. BENEFITS: Lifting the spirits and help to counteract discouragement, release pessimism, anger and fear, and soothe irritation. MY PERSONAL EXPERIENCE: By using this formula I discovered how much my anger was actually a cover for great disappointment and grief. Once I acknowledged that, and had a good cry, the anger lifted and I was free! I then saw myself shift naturally into a much healthier attitude. HOW TO USE IT: Take 5 drops under your tongue or in a glass of water 3 times a day until symptoms are gone and stay away when you discontinue use. Use every day for a month to help initiate lasting change in long-time situations. You could also add a dropper full to a water bottle and sip it throughout the day instead. If this is an essence formula you REALLY need you may see strong effects immediately, but effects are often cumulative over time. 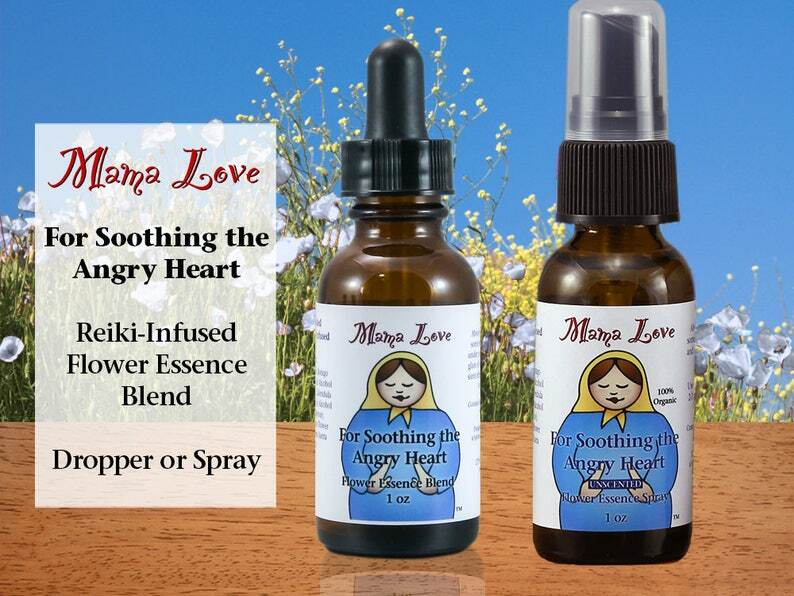 You may also choose to have this flower essence formula in a spray bottle for use on your skin or in your aura. Some people find it works even better that way. Use 2-3 spritzes around your head and upper body 3 times a day for a month or as desired. This formula is infused with Reiki to bring you the most beneficial product I can make. It is made from 100% organically grown and ethically wildcrafted botanical flower essences in distilled water with your choice of either conventional brandy (more flavor) or organic vodka (less flavor) as a preservative. It is UNSWEETENED so you don't have the effects of added sugar in your system (but feel free to add it to something sweet if you prefer.) And it's already at the perfect strength to use directly from the bottle (sometimes called "dosage strength"). Sprays are made with organic vodka to avoid staining. WHICH SHOULD YOU CHOOSE? If you are not confident in choosing flower essences for yourself, don't know what they are (did you know that they have NO smell? ), or really like aromatherapy, go with the scented oils or sprays! If you are an experienced flower essence enthusiast, follow your heart! Legal Note: People with a history of allergy and sensitivities are advised to use caution with any product containing ingredients you are not familiar with. While this product is made responsibly and should be safe for most people, it IS possible to have a reaction to just about anything. Typically, if you're concerned about sensitivity you should check the ingredient list, do a small test, and only continue to use it if you like how it makes you feel. Flower essences rarely but occasionally bring up unexpected feelings that have been known to trigger people with certain sensitivities.